We present below description of global trends in furniture industry. As an example we present also an analysis of furniture industry in concrete country – in this example it is Poland. We encourage you also to get familiar with our offer prepared specially for clients from furniture industry. Industry analysis of main trends in furniture industry. Industry analysis of global trends in the furniture industry in Poland. Introduce us your company and needs and we will adapt to you our services of export consulting, market research and finding clients, taking into account special requirements of furniture industry. The value of furniture market in 2012 was estimated by the value of manufactured furniture at 52 billion USD. The value of world export in 2012 was estimated at 9 billion USD. The average values of export and import had increased constantly between 2002 and 2007 and then plummeted in 2009 because of the financial crisis in 2008. Currently the industry remains stable in the case of values of the import and export. EFIC (European Furniture Industries Confederation) forecasts that in the near future the industry will stabilize at certain level – there are no sign of financial and economic crisis. The biggest manufactures of furniture are China and USA. Next places occupy Italy, India and Japan. The main exporter of furniture is China. The main receivers of their products are European countries (23%), Far East countries (8%), Japan (6%) and Australia, India, Malaysia, Indonesia and Singapore which are the fastest growing destination markets for Chinese furniture. The rest of the biggest furniture exporters are Italy, Germany and Poland. In the case of furniture import, the main driving force is USA. Till the end of 2006 the value of import was estimated at 26 billion USD; the value decreased significantly after the crisis but now recovers to the level before crisis. The recession caused that the value of furniture import in the USA went down rapidly from 26 billion USD in 2007 to 19 billion USD in 2009. The increase of the import values was recorded in 2010 and reached 23 billion USD. All of the main furniture importers experienced the financial crisis in 2008. Till the end of 2010 none of the main importers recovered to the level before the crisis – the closest were Canada and Japan, while the slowest recovery is recorded in the United Kingdom. The European furniture market accounts for 27% of world production, 28% of the consumption, 46% of the import and 45% of the world export. The Western Europe is the third largest furniture manufacture market and accounts for the half of world import. The main benefits of European market are: flexibility, innovative production, complex technology, advanced services before and after sale, developed distribution channel, advanced JIT production; furniture industry bases also on different buying forces than price (loyalty, positioning). The main challenges of European furniture market are: import pressure from medium developed countries, not perfect competition because of the labor prices, environment and safety requirements, protectionist tendencies and ageing of labor force. Furniture industry is one of the best developed sector of polish economy. Poland is classified in the top ten of furniture producers in the world. In 2012 operated about 100 large enterprises, about 400 medium companies, and about 1,7 thousand small enterprises, which employ less than 49 workers. Number of micro enterprises is estimated to be about 5 thousand. In Poland exist also about 20 thousand companies from different industries, which are indirectly connected with furniture production (for example steel or glass elements). About 126,7 thousand people is employed in furniture production (second quarter of 2012). Furniture industry accounts for 2% of polish GDP. Effects of the economic crisis in 2008, which affected many polish partners from euro zone, is still visible in polish furniture industry. According to B+R Studio Company, which monitors furniture industry in Poland, in 2012 the value of sold production of Polish companies from furniture industry accounted for 29,4 billion PLN, which meant 7,3% decrease in sales compared to 2011. In 2012 total production of furniture amounted to 90 billion pieces (including 7 billion pieces of office furniture – armchairs, swivel chairs; it was 13, billion pieces more than in 2011) and 67 thousand ton of steel furniture (increase of 15 thousand ton compared to the previous year). According to the Polish Ministry of Economy, the biggest share of products delivered by Polish companies constitute upholstered furniture, including chairs and armchairs (29% share in sold production), dining room furniture (23% share) and living room furniture (16% share). The production of furniture elements has 12% share and the share other groups (bedroom furniture, mattresses, kitchen furniture and office furniture) amounts to 1 to 7%. According to The Polish Chamber of Commerce of Furniture Manufacturers (OIGPM), decrease of sales revenues and the increase of the production volume can be caused by few factors: cheaper production, lack of revenues from additional services associated with the work of finishing the buildings prepared a year before for Euro 2012, firm consolidation and limiting subcontracting. OIGPM experts claim that the worse situation on the polish market resulted from the decrease of investment after Euro 2012 and not from the smaller customer interest. It is worth to mention that in 2012 in three out of four main furniture groups analyzed by GUS (Central Statistical Office of Poland) the amount of production increased compared to 2011. The biggest 15% increase was recorded in the kitchen furniture. The beginning of 2013 brought visible decrease in three out of four mentioned categories. In January and February the increase (0,5%) was registered in the category of wooden bedroom furniture. 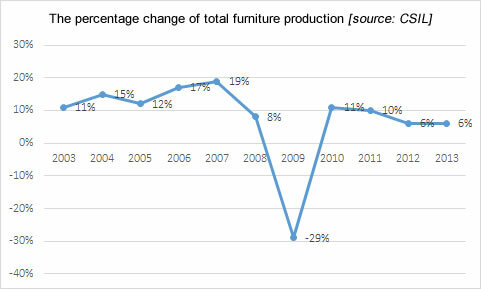 At the beginning of 2013 producers of furniture evaluated that the industry climate was worse than in 2012. Pessimistic feelings were also associated with the ratio of possible orders and declarations connected with the increase of current production. In 2012 the ability to fulfil financial liabilities on time by polish furniture companies was negatively evaluated by OIGPM. Negative tendencies in this case were also at the beginning of 2013 – more producers (up to 11%) declared that they have problems to settle their debts on time. It is worth to mention that the perspectives and forecasts of the production in the future are better and more optimistic than in the last period. Consumer feelings are not so optimistic. The climate in trade in January and February 2013 within the category “household goods” (including RTV, AGD and furniture) was much worse than in analogical period in 2012. Impact on these trends may have worse situation on polish labor market and relatively small increase of salaries, which causes that purchases of durable goods are postponed in time. It means that in short-term the dynamics of the purchases made by Polish customers may significantly decrease in terms of house equipment products. 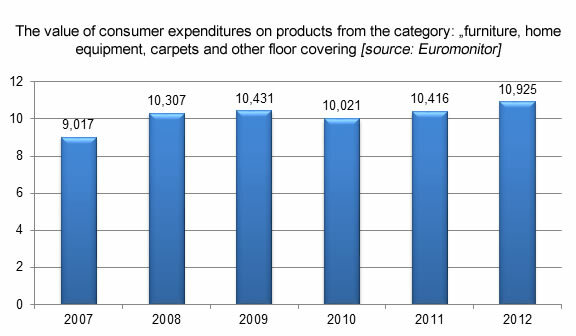 According to Euromonitor datasets, between 2007-2012 the value of expenditures on products from the group “furniture, home equipment, carpets and other floor coverings” increased by 21% and reached the level of 10,925 billion PLN (current prices). The Ministry of Economy estimates that the value of sales of furniture in Poland ranges from 7 to 8 billion PLN. Instead of relatively high demand, the impact on the increase of sales had the increase of prices (almost 25%) of products from analyzed category. About 50% of furniture sold in Poland come from our country, the rest is imported. Even though market feelings are not so good, export of polish furniture products increases steadily. About 95% of Polish production goes to abroad clients. Furniture export accounts for 5% of the whole Polish export sales. Poland is the fourth biggest furniture exporter in the world. According to B+R Studio, export of Polish furniture was worth 22,5, 26,6 and 27,9 billion PLN respectively in 2010, 2011 and 2012. In times of economic crisis and spending cuts, Polish furniture gain on popularity among foreign clients, mainly because of competitive prices, comparable quality in relation to other European countries and innovative and modern design. Polish furniture industry is supported by government institutions, like the Ministry of Economy. 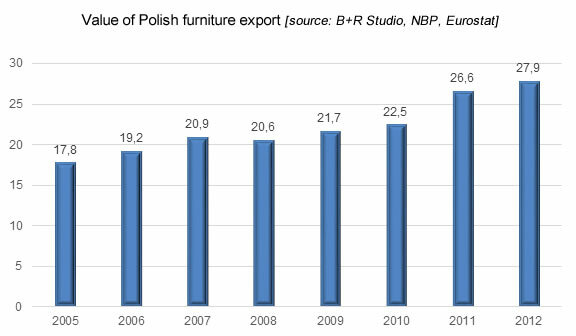 Import of furniture is relatively small and accounts for 15% of the value of Polish export of these products. Poland imports the most furniture from Germany, China, Italy and France.